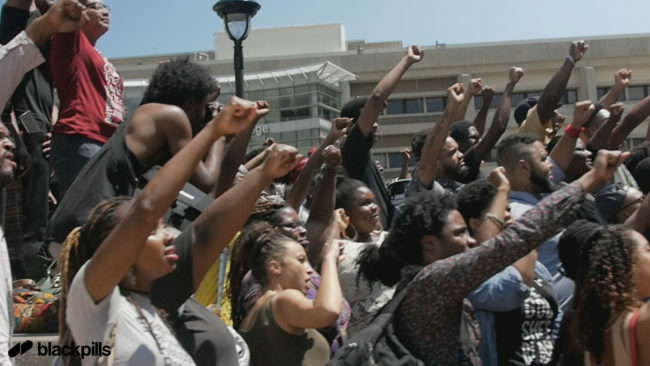 You are already familiar with the social justice message of Black Lives Matter. The focus on social and racial justice makes BLM easily one of the most importance movements in modern American history. Going hand in hand with activism around police brutality and protests against systemic racism within law enforcement and the judicial system is the need for major reform around the American prison industrial complex as well as our mass incarceration problem which disproportionately affects black and brown citizens. 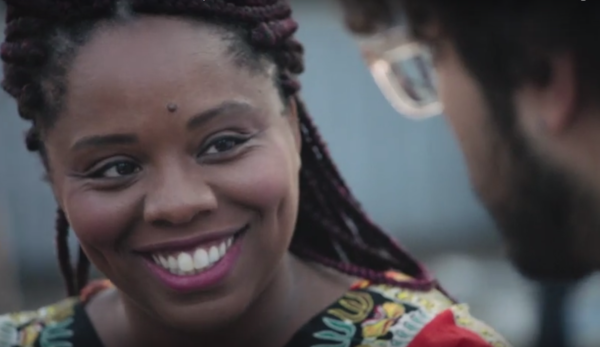 BLM co-founder Patrisse Cullors, based in Los Angeles, has been involved in local protests against a proposed new jail in LA County. Her efforts are the subject of a new docuseries from digital content platform BlackPills appropriately titled ‘Resist’. 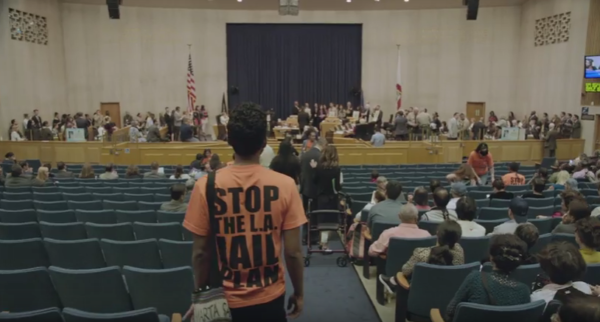 Produced by Pulse Films, ​’Resist’ ​picks up after the public ousting of corrupt L.A. County Sheriff Lee Baca and follows ​Patrisse, along with a group of community organizers who work together to shutdown the jail. The series explores their grassroots efforts and gives a first-hand look behind the scenes of their powerful activism in action, challenging the status-quo. Each episode explores different personal stories and shows how the families and loved ones fight for their freedom after they are incarcerated. As the series unfolds, the issues of cash bail, unlawful arrest, over-policing of black and brown neighborhoods, and mass incarceration are examined. The community and student activists band together to attack the legislation that is targeting each concern. The series features Cullors, and fellow activists Jonathan Perez (Co-Founder, Immigrant Youth Coalition​), ​Jayda Rasberry (D​ ignity & Power NOW​), ​Bamby Salcedo (Founder of TransLatin@ Coalition), Rosario Dawson (Actor, Activist), and many others. It is a timely and very relevant series at a time under the Trump administration which, through the Jeff Sessions-lead Justice Department is reviving Reagan-era “War on Drugs” directives around marijuana which has been the catalyst in seeing a large number of black men incarcerated in the largest prison system in the world, despite overwhelming evidence to show it does not reduce the presence of drugs. 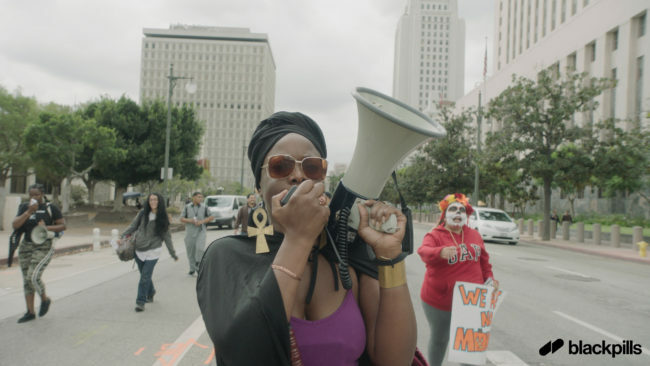 We spoke with Patrisse Cullors to get a better idea of the reason for protesting the new LA County jail, why everyday citizens should care about the issue of mass incarceration, and her personal social justice perspectives in the current political era. How did the idea for the “Resist” series initially come together? Dream Hampton and I had been developing content that looked at the role organizing plays in building movements. We asked Mervyn Marcano to join the team because he is a master story teller and content creator. We sat for weeks developing a series that was originally looking at cities across the U.S. and Canada. We decided to pare down the series once we pitched it to BlackPills so we could focus on a team of people working on fighting mass criminalization. Los Angeles has had a series of scandal and upheaval over the last 20 years. Organizers including myself have been moving on fighting the $3.5 billion jail that is slated to be built in the next few years. Over the past few years there has been an increase in awareness about the ineffectiveness of mass incarceration and the way it disproportionately affects black and brown communities. What do you hope ‘Resist’ will show viewers about this issue? I want viewers to see the impact incarceration has had on poor communities, but I also want viewers to understand there is a vibrant movement that has facilitated and ushered a new imagining of what is possible beyond incarceration. I want viewers to join the movement to stop criminalization in their own communities. The prison industrial complex and systemic racism is at the core of the Black Lives Matter message. As one of the co-founders of one of the most important social movements of our generation, can you see change happening? I do see change happening. 5 years ago people weren’t interested in talking about anti black racism. Today we are watching our communities galvanize mainstream media and social media – a new reality that challenges the white belief system- and provides a foundation for fighting against racism and patriarchy. Out of all the people you spoke to for ‘Resist’, was there one story in particular from this series that affected you more than others? Helen Jones story broke me. Her son was put into solitary confinement and beaten to death by Sheriff deputies. I think Helen’s tenacity and clarity and fierce commitment to justice was so inspiring and heartbreaking. Do you believe grassroots activism is an essential part of bringing about change? Grassroots activism is the key ingredient to bringing about change in the world. Some people think being an elected or an appointed official is the main ingredient for changing the world, but it’s the people that can make or break legislation and culture. What are some types of legislation voters need to be aware of when it comes to mass incarceration? 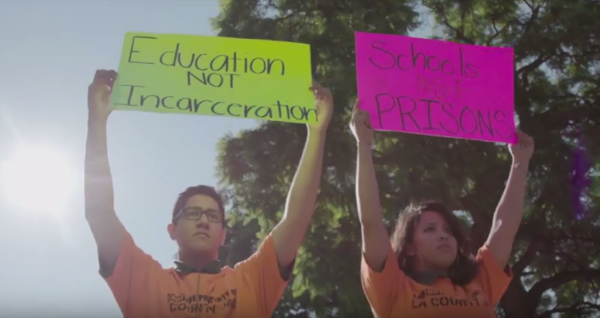 Justice LA is spearheading the Reform Jails and Community Reinvestment Initiative, an L.A. County ballot measure — the first of its kind in the country — that will pave the way for reducing recidivism, preventing crime, and permanently reducing the population of people cycling into and out of L.A.’s jails. The initiative empowers a civilian oversight commission to develop a plan to reduce the jail population and reallocate dollars from the jail budget to community-based prevention, youth programming, and treatment. LA County Supervisors have thus far refused to create such a plan, and have proceeded with their agenda of planning to invest $3.5 billion in building new jails. This ballot initiative will stop the jail construction plan in its tracks. Instead, decisions about how to spend justice-related dollars will be made by and accountable to the community that those decisions effect. How does ‘Resist’ address issues surrounding Police Brutality specifically? The focus on Helen Jones and her son who was killed by a sheriff inside of LA county jail as well as Quan’s family is important because we often talk about police brutality outside in the streets and we don’t often talk about the inside jails and prisons. I think the work of RESIST docu-series is to look at the often lack of community support that families get when their loved ones die in a jail cell. You were recently in the UK talking about your activism and work for BLM. How is the US mass incarceration problem seen overseas? There are issue of mass incarceration and over policing exists in most western countries where Black people are. In the United Kingdom the BLM UK having been working to interrupt issues of those in custody and working to challenge the conversation that the UK isn’t “as bad” as the U.S. I was able to meet with many families, campaigners and organizers who have really dedicated their life to making sure that mass criminalization is discontinued inside the United Kingdom. You are also a senior fellow for the Moms Rising organization, and have spoken out about maternal mortality in the US, which disproportionately affects black women. Can you speak to why this is an essential part of your justice work? As we’ve seen from Serena Williams’ near fatal birth experience, wealth and fame couldn’t protect her from the racial discrimination that exists in childbirth for black women. The troubling truth is in the U.S. Black women die at 3-4 times the rate of white women of white women independent of age, economic status or education. Black women listen to black women– which is why we’re starting to see a resurgence of the black midwife. Midwifery has long served as the cornerstone of care for the black community. In fact, the first midwives in this country were enslaved Black women. But midwifery has been under attack ever since it was criminalized in the late 19th century, when childbirth and obstetric care was monopolized by white, male doctors. This type of community-based care made a huge difference for me during my pregnancy. When my two black midwives were by my side, I always felt safe and cared for. But complications forced me to go to the hospital for an emergency C-section where doctors ignored my pain and failed to inform me of potential side effects and proper postpartum care, which caused pneumonia — a common and avoidable side-effect of a C-section. Integrating midwives into our primary healthcare system is an important way we can combat death during pregnancy and delivery. Black women have the power to reverse the statistics by bringing back the midwife and sharing the impact of racial and gender biases on our health. If someone is motivated to get involved after watching, where would you direct them? Folks should check out BlackLivesMatter.com if they would like to be involved in local chapters. If you are in Los Angels, JusticeLA.com and ReformLA.com are two important organizations working locally to end mass incarceration. To watch ‘Resist’, download the BlackPills app. BlackPills is a digital entertainment production company and platform. Free app for smartphones, tablets and now on Apple TV. They distribute premium episodic content/mini series and docu series. Some of their hit shows include: ‘Junior’ (Directed by Zoe Cassavetes), ‘Pillow Talk’ (with Patrick J Adams from Suits), ‘Playground’ (Created by Luc Besson), ‘Virgin’, and more.